David Wright’s power numbers were down the second half of last season and he’s off to a little bit of a rough start this year. However, one thing I’m tired of hearing about is the Home Run Derby and how it messed up his swing. This is not an exclusive argument to Wright and has been applied to many players. Obviously the biggest detractor from the argument is to look at how the Derby champion, Ryan Howard, did afterwards. His swing certainly didn’t look messed up. I find it really hard to believe that a professional hitter, which is what all of the participants of the Derby are, can be messed up by a couple of hours of extracurricular fun. Why do those 50 or so swings have a bigger effect then the dozens more a player does between the derby and his next regular season game. At the very least he’s got the All-Star Game and any warm-up associated with that, plus batting practice of the next game after the break. Besides the hours of batting practice Wright and other such players had for the last 80 games or so, there is also a hitting coach and 24 other players (Okay, more like 12 other hitters) on the team that can help out if his swing looks a little off. So does the Home Run Derby actually affect a player’s power numbers for the second half of the season or is it just another stat anomaly that people read too much into? My bet’s on the latter. The Mets finished out the sweep of the World Champion Cardinals. They played very sound baseball, and John Maine pitched magnificently. If he pitches this well all season, there is little doubt that all the worries about the Mets rotation were short-sighted. Alternatively the Cardinals looked horrible. They scored two runs, in three games. They made errors, and the bullpen exploded. The Mets will definitely face stiffer competition this year, but it’s nothing this team can’t handle. They seem to be in mid-season form. The Mets played wonderfully last night. There were some blips here and there, and some nice plays to get them out of trouble too. Watching them play like a continuation of 2006 and nothing like this past March just reaffirms how I feel about them taking this division. I wouldn’t be surprised to see them be the first team to clinch a spot in the playoffs again this year. Willie Randolph is a big part of that. Even when I disagree with his moves, I can see what he’s thinking and understand it. I love that he continues to put Wagner out there in non-save situations, challenging him to be ready always. He won’t be surprised again to come into a four run game and blow it. I also like that he’s open to change, experimenting with David Wright batting second in the spring. I really like Joe Smith, think he could be a big part of the team this year, and it was great to see Willie put him in last night where he could get his feet wet. The season continues, A-Rod’s already made an error and struck out with runners in scoring position. Hopefully the Mets will continue to make news so that we don’t have to listen to the jibes about A-Rod and if he will opt out of his contract all year. Just a couple of more days until the season starts, and the Mets still seem to have plenty to figure out after they tied the club record for most losses in spring training today. Duaner Sanchez is sidelined for at least a couple of months and after what amounts to about a year off, will he even be as good as he was at the beginning of last year? Will Heilman still be able to be good this year with his starting ambitions and his tendonitis? How long does Shawn Green get before he gets benched for Milledge, and is Milledge ready to be a major-league contributor? What about Jose Valentine and second base? Can Anderson Hernandez learn to hit major league pitching well enough to take his job if he struggles? The starting rotation is either old or mostly untested, which leaves one question. Is this going to keep the Mets from getting to the World Series, where both the organization and fans expect them to be? I believe that it won’t keep them from it. Spring training games mean nothing, and the players know this. The beginning of the season is full of motivating to get pumped and get into the game. First they open the season by watching the Cardinals ceremony, reminding them of their failure last year, and I’m sure the reporters there that day won’t be hesitant to ask them about it. The next series, on Friday, is Atlanta’s home opener. While none of the current Mets really have connections to the Mets struggles at Turner Field and with the Braves, they’re still a division rival who wants their title as Champions of the East back. If that wasn’t enough they come home Monday to play the home opener in front of 55 thousand fans whose last glimpse of the Mets was watching Wainwright’s pitch go past Beltran for strike three. They open against the Phillies who many people have picked to win the division this year, Shortstop Jimmy Rollins included. The Mets have enough offense to get some runs produced, plenty of speed, and good defense in most positions. While everyone points to the Mets rotation as the weak point of the team, they do it from a pessimistic standpoint. Who’s to say John Maine, Oliver Perez, and Mike Pelfrey aren’t going to be good this year? These statements aren’t made out of recent history, as there is very little of it, and most of it’s good. John Maine and Perez pitched well last year, and came through when they were needed in the playoffs. Despite being decimated by injuries, it wasn’t the Mets starting pitching that kept them from the World Series last year. There were many candidates for the 5th starting spot in spring, and while most of them didn’t pitch so well, it is only spring. Pelfrey will get his shot by mid-April and if he doesn’t succeed, chances are one of these other guys has been pitching well in New Orleans and can come up and pitch. Omar Minaya shouldn’t be forgotten either. It’s perfectly legitimate to expect that he could make some moves and bring in help where it’s needed mid-season. However, without having to even do anything, the Mets will bring in a top, Hall of Fame destined pitcher around the trade deadline in Pedro Martinez. Is anyone else involved in a playoff run at the time going to be able to do as much to improve the rotation? Baseball is more than stats and numbers. The Mets are more then they appear. A lot of people are talking about a lot of issues the Mets have; Unknown back end of the rotation, questions at second base, iffy corner outfielders. They compare the Mets to other teams, like the Phillies, and match them up position by position. Appearances are not all they appear however; the Mets are more valuable then they would appear on paper. Can you quantify the effect a player like Jose Reyes, who is always playing 150%, always smiling, and leaves no doubt that he absolutely loves what he’s doing? How about the zany antics of Pedro? The incredibly intelligent book-keeping of Delgado on all the pitchers he faces, and his willingness to impart his knowledge in the clubhouse? What about the competition imparted by having nine competitors for the last three spots in the rotation, and the knowledge that even after they get it, there are a bunch of guys possibly pitcher well in triple-A that could take the spot? Not to mention that they’re still competing within the rotation because Pedro is coming back to claim one of the spots. What about the bench? A lot of big plays and moments come from players who are just bit players. This was probably one of the Mets problems last year, and Omar worked at fixing it for this year. There are a couple of players that are looking good this spring, and players like Endy Chavez still looks good. I’d like to see him get 40-50 starts this year. The Mets rotation will likely continue to be good this year. Heilman, Sanchez and Wagner should still be good, and some other guys in camp, like Joe Smith, are impressing. Overall baseball is about more than stats and formulas. The Mets may not be as impressive on paper to be a sure thing to win the division, but there are factors there that people are missing. The drive of individual players is very important. Delgado, Reyes, and Beltran are just some of the everyday players that have come out early in camp talking about their statistical goals for the season, the ways they are going to improve. Expect good things from the Mets this year, and you won’t be disappointed. It gets harder and harder to get the platinum level type ticket every season. Last year I managed to have tickets for opening day, and all three subway series games. This year I have 3 tickets to opening day, and 3 tickets to one of the Subway Series games. I also have 4 tickets to a second subway series game, but that’s only because I took the financial hit and bought a Saturday season-plan which included one. Sadly baseball is becoming, at least here in New York from my perspective, a sport for richer folk. Now I don’t remember the days where you could see a baseball game for less than the current price of a mocha at Starbucks, but even at 24 I can see the ever increasing cost of being a fan. I understand that a fan has to remember that baseball is a business, but I think that _baseball_ needs to remember that it is also a game and a passion of a lot of ordinary, average people. It’s understandable that baseball tries to make money, by offering corporate boxes, charging more for prime games, and the like. There are millions of us out here that are fans that cannot come up with hundreds of dollars to see a couple of games, but are willing and enthusiastic about spending what money we have on the sport we love. Making it hard for the average fan to buy a cheap ticket, even to deep bleacher seats just alienates us, and mutes our interest in the game. Some people have wonderful memories of paying quarters to get into memorable games of baseballs rich history, remember getting into the bleachers just so they could see some of baseballs great players play. Others listen to stories of fathers, or grandfathers, or uncles as they recollect some of the exciting games they went to, even if they weren’t rich, while we listen on, remembering just how much to costs to be able to goto a game today. 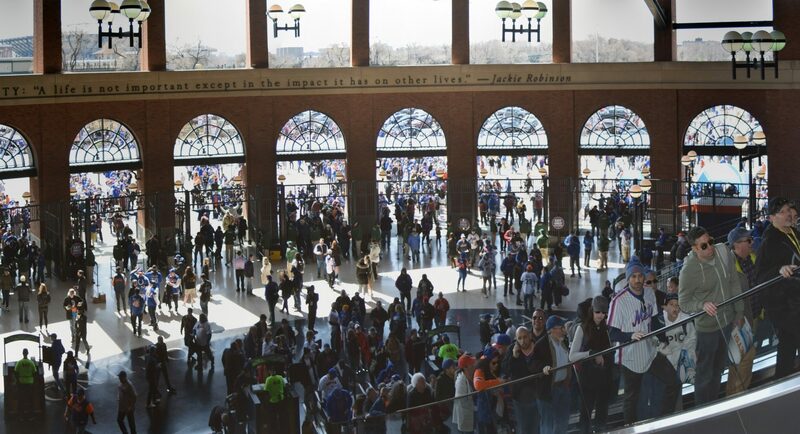 With the construction of Citi Field, and others like it, the philosophy of having no bad seats is a wonderful one, but if the trade off is the cheapest ticket being $20 or $30+ dollars, I’d be just as happy watching it at Shea. For the true fans, it’s not about the seat, the concourses or the view. It’s about the game in front of us. Beltran seems confident this year, and thirsty to improve. It’s good to see a player that had a good year last year still striving for more. He wants to win an MVP, and steal more bases. This will lead to more walks for Delgado, and will put David Wright in the situation to really hurt teams early. The Mets excelled at first inning runs last year, and with Reyes poised to steal at least as many, and probably more, and Beltran looking to eclipse his totals from the last two years in this year alone, the Mets look like they’ll be able to continue the trend of scoring first. When Reyes and Beltran are on, opposing pitchers are looking at the possibility of having to retire both Delgado and Wright or risk at least two runs. Another bonus, especially on the road, is the effect on the Mets pitchers. Having a lead early is obviously a good thing, and with a lot of the Mets starters being young and inexperienced, this could help them settle in and help win games. Maybe it’s because it’s the first year the Mets have made the playoffs in a while, or maybe it’s because of how devastating it was leaving Shea after game 7, but i’m very impatient about the start of the 2007 season. Even though the roster is still unknown, there are a lot of young pitchers out there ready to make the team and shine. And a lot of them will get the chance to. Orlando Hernandez will probably miss a couple of starts here and there, and there are always injuries and switches during the season. On top of this, Pedro rarely pitches a whole season, but this year it will be the first part of the season he misses, so that when the time comes to pitch in the playoffs, not only will he hopefully be energized from missing it last year, it’ll feel like July for him as he’ll only have been pitching a couple of months. We’ve got enough relievers out there to find something that works and Wagner…well, he’s not Rivera, but what else is there? Delgado is a very smart player, and after his struggles last year, I think he’ll be having a monstrous year, Reyes is only going to get better, i’m predicting 70+ steals this year. David Wright is only improving too, and as of yet he’s the only position player in Port St. Lucie right now. He’s going to hit 30 home runs and 130 rbi’s this year. I’ve been saying this all off-season, and he’s been doing great in the games he’s been playing, I think Anderson Hernandez is going to be a starter on this team. I miss Cliff Floyd, and I think he’s going to have a huge year this year, but I think are outfield can get it done. I’m interested to see what happens with Milledge. I’m strongly considering trying to goto Spring Training this year, but if not, I have every intention of winning the lottery and scoring tickets for opening day.